Summer draws people seeking a good time to the Portage Lakes, but not every resident appreciates the increased activity in the community during the warmer months of the year. At the July 12 meeting, the Coventry Board of Trustees heard residents express frustration with a newly established business on the water. The residents told the board the new bar and restaurant, Pick’s at PLX, located at 530 Portage Lakes Drive, is disrupting their daily lives, specifically their sleep, due to noise and bright lights. Complaints concerning the site, which formerly was home to Hook, Line and Drinkers and Nicoletti’s Park Place, are not new to the trustees. The board in the past also took complaints, often regarding noise, when the former businesses were in operation. Trustee Ed Diebold said the township has taken noise complaints regarding Pick’s and those have been relayed to the management. He said Donnie Boyer, former owner of the Legends in Green, who runs the establishment, wants to dwell in harmony with the nearby neighbors. Residents Ron and Tig Swartz said the weekend noise lasts until 2:30 a.m., and that, coupled with bright lights, make it difficult to get sleep. She said she was told it would be a family atmosphere. Additionally, at the regular meeting, the board introduced the township’s new zoning inspector, Bill Meyerhoff, former zoning inspector for Granger Township. “I have big shoes to fill. George has been the zoning inspector for 30 years, and I would like to be half the zoning inspector he was,” Meyerhoff said of current zoning inspector George Beckham, who was not present at the meeting but is training Meyerhoff before officially retiring from his position. Meyerhoff said he is the husband of Leah Shriver, Ph.D., with The University of Akron, who is working currently on a medical breakthrough for patients with multiple sclerosis. Trustees said Meyerhoff came to the township with an impressive résumé and interviewed well. “We have full faith in him. This man is all about working for the good of this community and we are happy he is with us,” Diebold said. “He cares about the community, working with the board of trustees and putting the community first,” Seese said. Additionally, at the meeting, the board accepted a quote, in the amount of $15,000, to replace the carpet and linoleum flooring at the township’s former senior center, soon to be marketed as the community center. Diebold said the board is attempting to redevelop the center as a revenue avenue for the township. He said the center would receive a “cosmetic re-do” so the township can rent it out. He believes the improvements will pay for themselves once the facility is beautified and made available for use. The board also heard from Road Superintendent Lael Stouffer, who said the township’s extensive road resurfacing program now is taking place in Coventry. He said 7 miles along 46 roads in the township will be resurfaced this year. At the close of the meeting, the trustees also continued to hear concerns regarding the number of Airbnb rental homes along the Portage Lakes and the disruption they are causing some residents. The board said the matter is being investigated and solutions to the issues are being considered at this time. 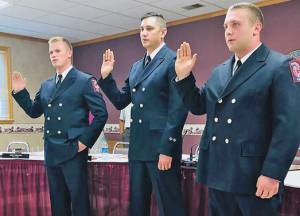 At the start of the meeting, a promotion ceremony was held for the Coventry Fire Department. Two department firemedics, John Barrickman and Devon Maavich, who were recently promoted to full time, and Brian Cyphert, who recently was promoted to lieutenant, were recognized for their achievements and existing certifications. Board Chairman Richard Kutuchief also administered the oath of office to the three men. The next regular trustees’ meeting will be Aug. 9 at 7 p.m. at Coventry Town Hall, 68 Portage Lakes Drive. From left, Coventry Fire Department full-time firemedic John Barrickman, Lt. Brian Cyphert and full-time firemedic Devon Maavich take the oath of office at the July 12 Coventry Township trustees’ meeting.